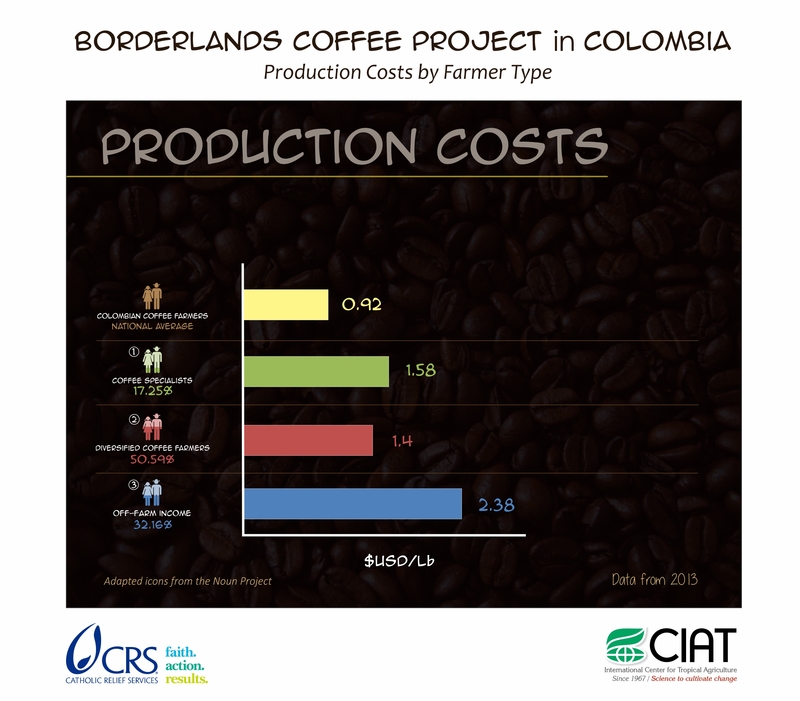 At The SCAA Event last month, our CIAT friend and colleague Mark Lundy presented the results of costs-of-production research we did together on the basis of 2013 data from our Borderlands Coffee Project in Colombia. Today I explore with Mark what we learned from those data and what implications they may have for coffee buyers and policymakers. 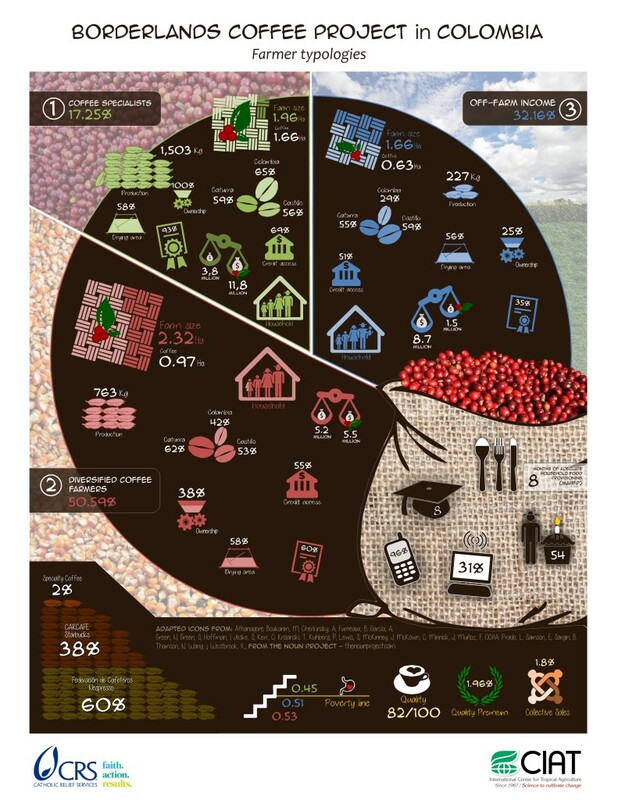 Each one has different level of dependence on coffee for their income, a different cost of production and a different return on their investment in coffee. Specialized coffee farmers have the most area devoted to coffee, the highest production and rates of productivity, the highest incomes overall, the highest coffee incomes (both in absolute terms and as a percentage of total income) and are most likely to own processing equipment, hold a high-school diploma and have access to credit. They are least likely to be poor. This disaggregation added an important dimension to our analysis. What were overall mean net incomes (all sources) for the three categories? Did you look at remittances, a study we (HRNS + IC) did last year showed quite high levels. 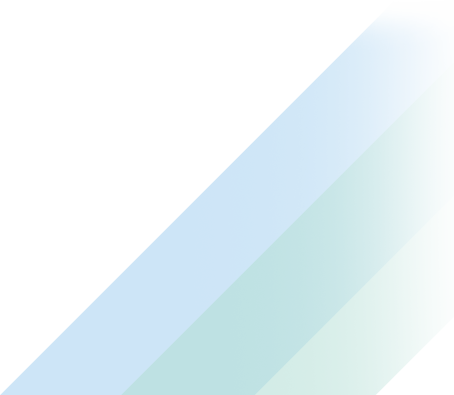 What does the icon with the rosette mean – it’s a certification I assume, but which was predominant, or were there differences between groups? Surprising that even for specialists only 58% have a drying patio – the rest sell in cherry? Quality premium only 1.96% (i.e. above Colombian mild price?)? Surely must be higher than that? Can’t figure out the poverty line icon – clarification? Peter, let me try to clarify your questions here. We do not have overall mean net incomes because we did not gather production costs for all non-coffee and non-farm income streams. We only worked on net income from coffee. We can share the distribution of income streams but the headline numbers are reflected in the balance for each farmer typology between coffee and non-coffee income. We asked about remittances (both public and private). A small percentage (5%) report receiving public transfers in the form of conditional cash transfer payments. Reported private remittances were surprisingly low. The rosette on the bottom right is the percentage of farmers who receive a quality premium (less than 2%). The certification figures are reported on the diploma in each category and cover all certifications. Most commonly reported certifications were CAFE Practices, Nespresso AAA and Rainforest Alliance. The drying patio refers to ownership of that specific piece of infrastructure by the household. Farmers without a drying patio dry their coffee on the dirt, the road in front of their house or at their neighbors home. It is uncommon for farmers in Colombia to sell cherry as shown by the relatively high ownership of depulpers. Nariño receives the highest price in Colombia for its coffee due to perceived quality and competition between large buyers. The 1.96% refers to the percentage of farmers who received a premium for cup quality. For poverty measures we used the Progress out of Poverty Index from the Grameen Foundation. The figures represented show the probability of each type of household being below the national poverty line (e.g. coffee specialists have a 45% probability of being below the poverty line). The other two types of producer households had greater probability of being below the poverty line. Do you have a report for circulation? Would love to see the tables the infographic is based on.